Part of my agreement in obtaining a loaner E75 with WomWorld/Nokia involves taking part in a challenge called 'Teach the Technophobe'. Each week I'll receive four challenges of sorts, where I am required to tutor a technophobe friend or family on the E75's various capabilities. My technophobe of choice is my partner, who while once used a smartphone (HTC Magician) for two years is completely oblivious to their messaging and web capabilities, and never use any advance functionalities like document editing or GPS. Today I received my first challenge where I have to coach a technophobe on how to set up an e-mail account on the device and send a test message. It sounds simple enough, but it isn't always the case with previous mobile technology. I remember back in my Palm OS days where I have to set up my Sony Clies and Palm/palmOne devices to synchronise my e-mail account (Yahoo! UK). 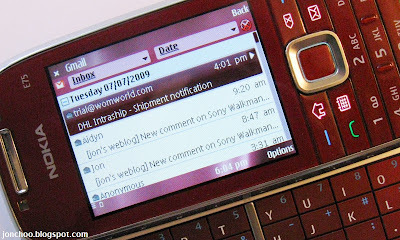 The devices back then have no mobile phone capabilities, so one of the few ways of pulling down e-mails was through using a mobile phone (typically a Sony Ericsson back then) as a modem. This can be done via either Infrared (remember those? ), Bluetooth or wired tethering, and keying in all the necessary port address, numbers and whatever else that is required. It was do-able, but I can see how newbies will be put off by all the steps required to just receive an e-mail. These days such excuses are no longer valid. With newer and more matured platforms, setting up e-mail is easy as steps are largely automated, as most of the process are handled at Nokia's server end. With the E75 this is easy. Nokia has made huge improvement with the way their enterprise devices handle e-mail. The E75 e-mail clients supports both traditional POP3 and IMAP based e-mails such as those provided by popular free web-based e-mail like Yahoo! or GMail, as well as corporate e-mail by way of Microsoft Exchange push e-mail technology. My partner has a work e-mail account which, with my help, was setup to fetch them in no time. Setting it up to use with her web-based account was even easier. It took her less than 5 minutes to get the two e-mail accounts running on her E75. Creating an e-mail account on the E75 is easy. First launch the E-mail application, the click on 'New', which will launch the e-mail account creation wizard. Here you can select the connection required by the E75 to access the internet (such as 3G or WLAN). The next dialog box will ask for the e-mail address (example@example.com) and the next will require you to key in the password. If you are setting up an Exchange account, you will need to input further settings such as the web address where your company's Outlook Web Access resides. Likewise if you are using an obscure e-mail service or is hosting your own e-mail server, you will need to input the settings manually, though I suspect people who does so will have no problems doing so. Once you are done, the e-mail client will receive a new icon (in the form of whichever webmail you choose, Yahoo! and GMail icons both turned up fine) which takes you to your e-mail account, where you can connect and syncronised your e-mails. Advance settings are available that allows you to customise each of your mailbox. For example you can set it to retrieve only a certain amount of kB or the number of messages from the inbox it is allowed to download. You can also set it to syncronised folders (IMAP only) or and the update interval it connects to your mailbox. 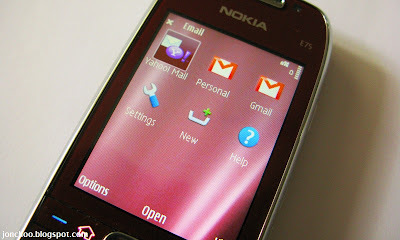 Nokia's e-mail client may lack the glamour finish of its rivals, but what it lacks it makes up for its ease of use and vast amount of functionality. Attachments is supported, as is the ability to set priorities. There are plenty of powerful shortcuts to remember that will no doubt increase productivity. For example if you want to reply to an e-mail, just press 'R' on the keyboard. Similarly press 'F' to forward the e-mail, or 'D' to delete etc. The client also supports full HTML messages. I dare say Nokia's email client is rather lousy. 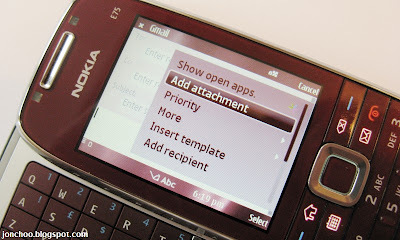 Contrary to what is claimed in the blog, Nokia E75 does not offer types of email account (POP3, IMAP) in the first go. It simply goes in a loop trying to ask for email settings from the server. However if you supply false email domain, like for example kadfa@alkf.ko, only then will it offer the options of Corporate or IMAP.POP mail. Even in that it does not explicitly offer SSL. 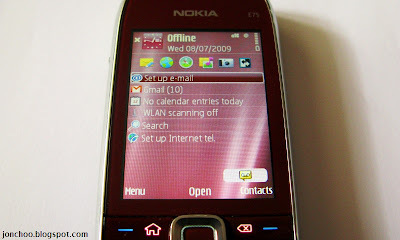 Conclusion: Nokia's email client in 2009 is really lousy and out of synch with times. 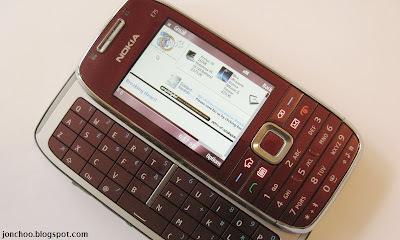 With the E75 at least you get a proper keypad, with the iPhone you can't even compose a proper e-mail. And yes, I have both. Both have its own strength but the iPhone's virtual keyboard is rather lousy for composing texts.